Over the past few years squatting has mostly been a marginal phenomenon in the Czech Republic. However, with the establishment of the autonomous social center Klinika in an abandoned former lung clinic in Prague, squatters came up with a new approach. Now, the movement is moving out of the periphery once again. Through its proposal for self-organized space sustained on the principles of autonomy, Klinika has reintroduced the critique of capitalist conceptions of democracy and freedom that remained largely unquestioned after the fall of the totalitarian communist regime in 1989. This new experiment has since successfully gained popular appeal at a time of re-surging Czech nationalism, which dominates through a politics of fear against migrants. At present, Klinika enacts a carnavalesque militancy with images of an unapologetically pacifist multitude of community-reproducing initiatives, mobilizing various social groups that in turn defend the center against recurring institutional maneuvers to close it. This has revitalized local anti-capitalist politics, which is breaking free from sectarianism and reaches out to — and directly impacts — broader society. The latter has since responded in ways demonstrating cleavages in Czech society between those looking for alternatives to the dominant system and emerging fascist elements, which increasingly influence institutional politics. 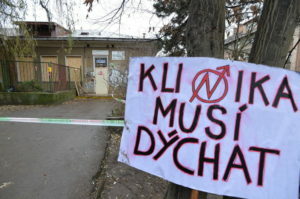 It has been a quiet time for squatters’ politics in the Czech Republic ever since the closure of Prague’s Milada squat in 2009. Until the autumn of 2014, when activists claimed an abandoned clinic to create an autonomous social center, the local scene was missing a shared space to voice its alternative politics and to create a safe environment for communal activities. Despite emerging out of the squatters’ movement, with many people coming from the Obsaď a Žij! (“Squat and Live!”) collective that struggled for years to put the issue of empty, wasted spaces on the public agenda, Klinika was meant as something bigger than a squat. Unlike other preceding projects, the autonomous center in “Red Zizkov” (as its neighborhood is also known) aspired from its conception to be more open, reaching out beyond the “activist ghetto”. This required a strategy to construct a favorable public image, which forced the occupants to avoid framing their action in terms of squatting, as this was viewed negatively by the public. Popular perceptions identified squatters as junkies, impossible to remove from one’s property. Instead, emphasis was placed on the project for a social center, run by activists, aiming to create a self-sustainable space without grants, donors or state funding. A further aim was to show that another way of doing — contrary to the logic of the market — is possible. When in late November 2014 the squatters took over the abandoned clinic, explanatory letters quickly spread throughout the neighborhood, a public phone number was set up and open assemblies soon followed, engaging the neighbors in cleaning and organizing various social and cultural activities. Communication via social media was as intense as the work in the house, with traditional media also projecting images from Klinika, which contrasted the decaying building that nobody wanted to the efforts to bring it back to life. Ten days later came the eviction. It was neither unexpected, nor discouraging. 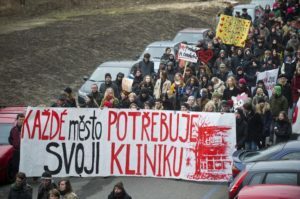 The next three months saw intensive campaigning to reclaim Klinika, culminating in a large demonstration that was crucial for the collective’s determination to maintain pressure on the authorities. The result was that many famous individuals decided to support Klinika’s cause, which brought about the necessary attention that eventually led to the Finance Minister stepping in, offering a one-year rent-free contract on behalf of the department-owner, starting on March 2, 2015. Klinika is part of a leftist tradition resisting the omnipresent forces of neoliberal capitalism. But the developments in and around our small autonomous center in Prague also reflect a creative power that possesses its own, genuine voice. The very existence of Klinika seems to have opened up new spaces or broadened already existing opportunities for collective action in the fields of sexism, racism, ageism and other, intersecting forms of discrimination. The social laundry at Klinika, established particularly for the homeless to use, presents us with a telling example. The issue of homelessness has been part of the center’s story from the start. Paradoxically, some of the narratives adopted by traditional media in defense of the squatters portrayed them as saving the building from “homeless junkies”. Klinika’s response was to explicitly denounce the vilification of those who found themselves stuck in the lowest echelons of society. While expressing our support for the homeless, we remembered how we had been the target of similar name-calling not very long ago. Klinika has since launched its own critique, calling for an equal right to the city for everyone. As was made visible by the Obsaď a Žij! collective prior to the squatting of Klinika, the problem of homelessness exists side by side with others — like the real-estate “developers” — assuming private control over the city for their own enterprises. This is why the activities in our autonomous center are done in solidarity with those at the bottom. However, for a long time it was hard to find a way to materialize this position. The building was still in poor condition, with electricity and water connections slowly being set up and few rooms ready to live in. We only found a way to engage with the crisis of homelessness crisis when a group of social workers approached Klinika to ask for space to organize their social laundry. A few months later, it became one of the center’s many autonomous projects. For more than a year now, we are building autonomy in Klinika, with the goal of creating a safe space against all forms of oppression interconnected within the totality of capitalism. This is one of our core principles; one we keep developing on a daily basis through the practice of creating an autonomous center. The individualizing forces of neoliberal capitalism have prompted us to search for something else, and the ongoing experiment at Klinika is an attempt to rediscover freedom in the personal autonomy to act, to acquire knowledge and take control of our lives. This, however, can not come without collective autonomy, which depends on our ability to share and cooperate in order to rebuild our communities. This collective autonomy is the form we adopted to allow ourselves to directly address the issues that concern us, both personally and as a group. In this sense, autonomy is our politics — and we do politics every day. Meanwhile, Klinika is also meant to be a place for others to come and organize their activities with respect to the principles behind the house. To our joy, it seems that the principle of autonomy is, in fact, contagious. It has attracted many who reproduce it on a daily basis. Some initiatives did, at first, move their activities to Klinika just to demonstrate their support, but others came precisely because of the way things are done here. Currently, there are self-organized courses in seven languages. A parents’ collective, called Mamatata, runs a kindergarten for their children every week. They have also become a familiar sight for the authorities, staging their activities on state premises in protest every time Klinika’s existence is under threat. There are also the meditation groups, the frequent feminist seminars, the free shop, the various workshops, the street radio — and the list goes on. Klinika is therefore not reproduced strictly according to the collective’s ideological point of view. In our case, an anarchist identity is openly assumed by most members of the collective, but one does not become an anarchist just by being or doing things inside Klinika. The “autonomization” of activities is produced equally by outsider initiatives that find a place at Klinika. It is people’s own wish to assert autonomy for their projects; we can only provide the space. And similar to the anarchist spirit, as framed by Malatesta, the collective does not want to emancipate the people, but for the people to emancipate themselves. The result is that an empowering vision of freedom comes to life within our little autonomous space. A freedom to be, a freedom that is non-negotiable. It is a matter of self-organization. We can conceive of it as a process; the process of commoning, through which Klinika is becoming part the “commons”. However, we do not forget that it also originates from an antagonistic relation to the dominant system. While developing its alternative environment, Klinika became immersed in another battle; one that currently captures Europe’s attention — the so-called “refugee crisis”. After the disconcerting reports about poor conditions in detention centers across the country came out last summer, Klinika was among the first to take action. The center was quick to provide a space for donations and collection, which was followed by a massive response by many eager to provide support. With the scope of the refugee crisis growing by the day, a decision was taken to organize channels and distribute aid to the Hungarian and Serbian detention centers as well. At that time, many saw that they were not the only ones empathizing with the refugees. This was the moment a pro-refugee movement got underway in the Czech Republic. In a country where according to some estimates up to 80 percent of the population opposes migration, this carries great significance. Ever since its engagement with the appalling humanitarian crisis on the borders of Fortress Europe, Klinika has certainly gained in popularity, while at the same time gaining much opposition due to the simultaneous rise of the nationalist and openly fascist groups like the Czech Pegida — Islám v ČR nechceme (“We don’t want Islam in Czech Republic”) — and Blok proti Islámu (“Block against Islam”), which enjoys broad support, including that of President Miloš Zeman. Both groups have identified Klinika as its enemy and have used their support base and pressured politicians to act against our center. In this radical anti-immigration environment, it should not come as a surprise that Klinika suffered an attack by neo-Nazis after anti-racist demonstration against borders. Following this event, the renewal of Klinika’s rent-free lease, which up to that point seemed to have the state-owner’s approval, was suddenly faced with hostility from the authorities, and later denied, forcing us to announce the illegal occupation of our building. The first sign that official attitudes towards us changed came almost two weeks after the attack — two weeks before the agreement with our owners from the Bureau for Representation of the State in Issues of Property (UZSVM) was going to expire. As their own communication with us specified, they were being pressured by another authority not to extend our contract. The argument went that the building’s status of a medical facility was incompatible with our intentions to run it as a social center. Another influential individual targeting the UZSVM was the local district mayor Hujova, who launched an attack against Klinika calling it a “security hazard”. She saw danger for the neighborhood becoming a battlefield between left-wing and right-wing extremists, thus equating us with the neo-Nazis — a view she has since repeatedly expressed. For Hujova, people who identified as anarchist were, in fact, extremists. Unfortunately, she is not the only local politician to hold such views. While UZSVM claimed it can not renew the contract with the building unapproved for our purposes, legal opinion said otherwise. Lawyers revealed that it is, in fact, just a formality for UZSVM to change the status of its property. However, they were clearly unwilling to do so, leading us to believe that our owners are acting on political grounds, hiding behind legal excuses. Only days before the end of the contract, we organized a demonstration that — to our own surprise — drew 2,000 people in support of Klinika. Our street carnival descended on the local City Hall to counter accusations against us and call the bluff of our owner’s “inability” to provide a new agreement. On March 2, after authorities decided to ignore the public support for Klinika, we announced the illegal occupation of the building, insisting on real negotiations. Dozens of people joined, with hundreds more coming to infuse an incredible atmosphere that featured many new activities, to engage in political discussions or to listen to some of the country’s most influential thinkers who came to speak at Klinika. The people’s presence made it strategically inconvenient for the authorities to carry out an eviction. Then came a surprising discovery by the Green Party chairmen, revealing that the building was never approved to be used as a medical facility and had been operating illegally for more than forty years. However, even after UZSVM was caught in the act, its head of department, Katherina Arajmu, refused to change her mind about Klinika. Instead, she joined Mrs Hujova in her accusations that Klinika poses a security threat. Old arguments about squatting being illegal — which, up to that point had not been taken as relevant anymore — and speculations about not paying bills for water and electricity appeared, alongside accusations that neighbors’ complaints were piling up. This renewed attempt to hide the actual, political reasons for denying Klinika a legal status soon began to crumble, as happened with the initial argument about the building’s status. Police reports had earlier concluded that we pose no threat whatsoever. Moreover, their spokesperson announced that there is no intention of evicting Klinika as UZSVM has not pursued all possible ways to resolve the matter. Neither were any of the other accusations based on actual evidence, as was also revealed. Thus, after a more favorable view on the prolongation of Klinika’s contract prior to the neo-Nazi attack on the center, authorities have sought to use this act of aggression to continue the battle along bureaucratic lines and disregard the huge public support for Klinika. Currently, our occupation continues with the UZSVM maneuvering to prevent any real negotiations with other institutions that can grant us legal status. Nikolay Savov is a graduate student at Aalborg University with a focus on International Migration and Ethnic Relations, and a member of the Klinika collective.